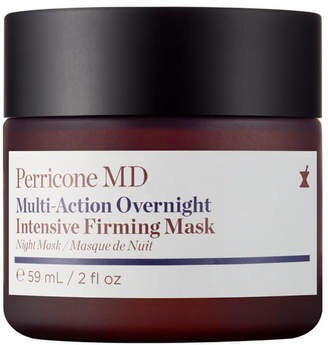 Lift sagging skin with Perricone MD Multi-Action Overnight Firming Mask ; a Coconut Oil-infused formula that targets signs of ageing, whilst delivering tightening and radiance-enhancing properties. Powered by Alpha Lipoic Acid and DMAE (the brand's signature patented ingredient), the night-time treatment works with skinâ€™s natural regeneration process to help minimise the appearance of fine lines, wrinkles and visible pores. Promoting soft, supple skin with a youthful glow, the velvety-rich face mask provides long-lasting hydration, as it tones and firms for a smoother, more refined texture. Wake up to a bright, fresh complexion with improved tone and elasticity. Not tested on animals. Paraben free.